Lip augmentation is one of the plastic surgery procedures most often performed. I often get asked questions regarding lip augmentation and why this is so important. When I was in LA lip augmentation was the main procedure which prompted me to look into facial beauty and ultimately lead me to find a new theory on facial beauty. The lip, especially the lower lip, is the center of attention in the mouth area. The location of the lower lip is part of a basic structure of how the face is organized. I recently had a paper accepted by the American Journal of Cosmetic Surgery looking into the distance between the iris, nasal tip, lower lip and bottom of the chin which supports the importance of the lips playing a major part in beauty. This is one of the reasons why lip augmentation is so powerful. The other reason is due to what the lips are related to in our daily functions. The lips are the area that we have major association with eating, smiling, talking, yelling, kissing, breathing. Some of our most basic and primitive functions are related to the lips. These basic functions have a strong connection with our limbic system which is also the area where some of strong emotions are. The limbic system has a major control over our heart rate, respiratory rate, blood pressure etc which gives our emotions the physical aspect that they have related to them. Hence lip augmentation emphasizes these feelings in the subconscious mind. Out of most all the things we do in plastic surgery Lip Augmentation can make the biggest “pow” to your aesthetics or beauty. In terms of the options, fillers are usually the first thing that most people consider. It is temporary, low risk, low downtime, and you can have almost instant results. On our lip augmentation page we say this about lip augmentation: “Feel more attractive and enhance the area that can have the most impact on your face. Lip augmentation can create that stunning effect.” And, we believe this to be true. 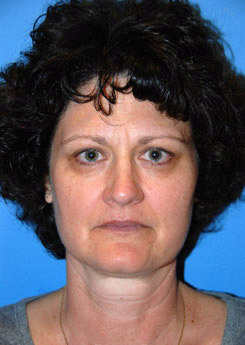 The drawbacks with filler lip augmentation is that sometimes it lasts only 3 months when it should last 6 mo to a year. Among the permanent options, Surgisil Permalip implants can be placed. These solid silicone Perma Lip Implants can be placed in the lips wet dry border to enhance your lips. The recovery is quicker than most and takes about a week. Some people loves this option, some (5%) don’t like the feel and the restriction. When this happens the option is taking them out, which I have done many times for people. In its stead, we often carry out fat grafting which works well in this situation. The fat seems to survive better after the permalip implants stretch out the tissues. Which brings us to another more permanent or longer lasting option, fat injections to the lips or the use of the YoungVitalizer for the lips. Fat injections to the Lips is less invasive, lower risk than other options but the complaint is that they don’t survive in the lips. This is a very real complaint. Out of all the areas of the face, the lips have the worse survival rate. Over injections can help this and so can technique. Botox prior to the fat injections can help but your lips may be weak for 3 mo from the botox. The major reason for the lower survival is the high movement of this area. The movement prevents the fat from receiving blood supply. Its like building a house during an earthquake. 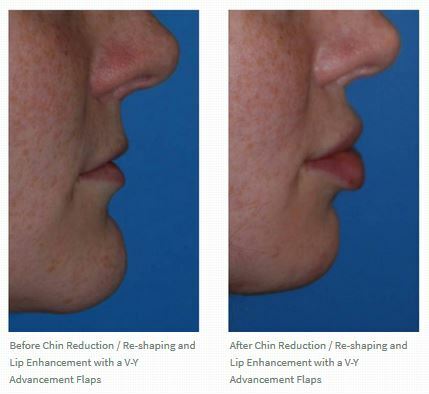 Lip VY advancement, VY plasty lip augmentation is another option. This involves taking V’s inside the lips and advancing the tissue forward to augment the lips the result is the V is closed to a Y shape with the V determining the amount and size of the advancement or augmentation. The recovery for this procedure is much longer and more varied. It is sometimes hard to predict how it will heal bu there are things you can do to balance it out. You can do more VY advancing where needed or do Lip Reduction in areas that need it. The main reason to do this procedure is if you want a major change to your lips and are willing to undergo the longer recovery. We have a healing diary for you to see by clicking here: Lip VY Advancement Augmentation Plasty Healing Diary. The Buffalo Gull Wing Lip Lift is a procedure which shortens the upper lip specifically the distance from the bottom of the nose to the upper lip. This can really make someone look younger and increase their aesthetics. This distance should be about the distance of the width of the iris per Dr. Young’s theory. When should you do this, when this distance is larger than an iris width you could benefit from this. You also have to accept the incision | scar under the nose. This can be hidden really well and controlled based on technique. This can be done to make the upper lip a little larger and more everted and pouty. A corner of the lip lift can be done as well. The incision however is at the corner of your mouth and many people don’t like this option. This can be used to elevate the corners and there is a way of altering the muscle to weaken the depressors of the lip so that frowning is weaker!! This is obviously something that people would like. Botox can also weaken the lip muscles to create a pout that is temporary lasting 3-4 months. Our office can also do this as well. Other options that can be done are fascia grafts to the lips, alloderm (cadaver skin elements) to the lips, solid one piece fat grafts for the lips. These options are not as good, in our opinion, because they get absorbed and very little augmentation will be longer lasting. 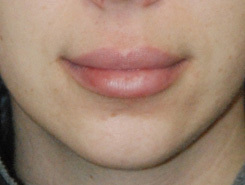 A lip lift done just at the top of the lips have been done before but this option is more invasive and leaves a more noticeable scar in this area. Many people do not like this scar and the location of this scar. Lip Injections | Enhancement | Augmentations Testimonial | Review Page Seattle | Bellevue Dr. Philip Young: Click here to read more: Dr Philip Young Bellevue Seattle Testimonials | Reviews Lip Injections. 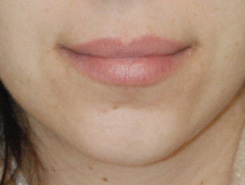 This person received restylane injections to fill and augment the lips. We believe we are better equiped to get you the best results based on our experience and our improved understanding of facial beauty. Knowing what makes the face beautiful is more than half the battle. In our field, knowing beauty is like having the correct architectural plans to build a house. We feel we understand beauty better. You can see our theory on beauty here in this video: Facial Beauty Theory by Dr. Philip Young. What are some of our secrets? Well first the bottom of the lip needs to be 2 times bigger than the upper lip. Also there is a limit to the amount of puckering that you want in the upper and lower lips. The lips need to be shaped like the eye to emphasize the most important element | shape of the face and that is the eye. You can read more about Lip Injections by following this link. Facial Fillers| Injectibles Testimonials | Reviews for Dr. Philip Young & Aesthetic Facial Plastic Surgery. 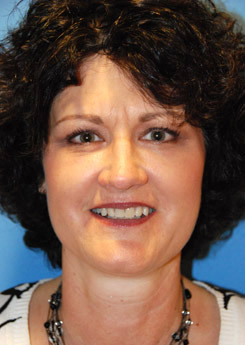 Click here to read more: Dr Philip Young Bellevue Seattle Testimonials | Reviews For Facial Fillers. What are facial fillers? Facial Fillers are products that are usually made up of natural substances that are chemically modified to allow them to last longer in our body. Restylane, Juvederm, Perlane are hyaluronic acids made by bacteria. The hyaluronic acid in some bacteria is chemically unchanged in humans. Meaning we have the same hyaluronic acid as bacteria. Fillers essentially give volume to our face in certain areas to make us look younger because aging is caused in large part by a volume loss. Here at Aesthetic Facial Plastic Surgery, we tend to use natural products that are safe. We would use all of the products and procedures here for our own family and friends. Also we’ll make sure that you are happy with your results. We usually give your results about 1-2 weeks to settle in and if there are not in any way what you were expecting we will help in every way to make sure to get the results you want. With Restylane we can fill it in more or take some filler out to make it look better. All you have to do is just let us know how you would like it. You can always reach us through our contact page here: Aesthetic Facial Plastic Surgery Contact Page. You can read more about our Facial Fillers by following this link. I watch this show with my wife every week. Not just this one, but we watch all the housewives series. The Beverly Hills Housewives are gorgeous in my opinion. Lisa Vanderpump is, in my assessment of facial aesthetics, the most stunning of all the housewives. I believe she might be the oldest of the group. I think Adrienne Maloof is gorgeous as well. She happens to be my colleagues wife, Paul Nassif who is an excellent surgeon. He trained me while I was at USC’s during my Head and Neck Surgery residency / Facial Plastic Surgery training. All the housewives are stunning in their own way. I was reading a blog or something one day about what plastic surgery they have done. To me it doesn’t look like they have had much done except superficial treatments like botox or fillers, in my opinion. Taylor appears to have had some lip augmentation which she has confirmed that has had issues. I think they have been augmented more than the lower lip. When this happens there is always a disconnect. Lip augmentation was one of the primary reasons that I started to pursue finding more answers to facial aesthetics. My theory believes that the upper lip should be half the size of the lower lip and not much more. The lower lip is the center of attention. If you look at any persons face and concentrate on the lower lip, you will see that most of the light that is reflected back to you is coming from the lower lip and not the upper lip. Taylor’s augmentation looks like it might be a permalip or some implant. I think Taylor is gorgeous even though she might think her lips are not as optimal as they should. I think all she would need would be to take the implants out and consider a temporary filler for the time being and possibly other forms of augmentation including v-y advancements, fat injections or replacement of the implant in a better position. The Buffalo Horn Lip Lift is a lift that entails incising under the nose with corresponding excision of skin and possibly muscle to reduce the distance from the bottom of the nose to the upper lip. Other names for this lip lift are Gull Wing Lip Lift or Under the Nose Lip Lift. The question is when do we need to do this as opposed to other procedures. Other procedures you can do our corner of the lip lifts, fat injections in the lips, silicone implants to the lips (Permalip), V-Y mucosal advancements, Temporary fillers to the lips. What is the ideal lip in terms of aesthetics is a great question to start answering this. The upper lip from the front should be about half the height of the lower lip. The puckering of the lower lip should exaggerate a highlight that is 3 iris widths wide or the same distance of the width of the eyes to emphasize the association with the eyes. I discussses facial aesthetics in my award winning facial beauty theory here: Theory on Facial Beauty. The puckering of the upper lip should be centered in the middle and should be one iris widths wide and 1/2 an iris width high. The height of the lower lip should be one iris width in height. The distance from the bottom of the nose to the upper lip border should be one iris width. Other points of beauty should be that the teeth with the lip resting open should show at least 3mm of upper teeth and the lower teeth should not be visible much at all. The upper lip should also protrude anteriorly beyond the lower lip by 1-2 mm. When you look at beautiful models you will see something interesting. All of the light that hits the lips is mostly concentrated on the lower lip. The lower lip is the center of attention when you look at someone and not the upper lips. 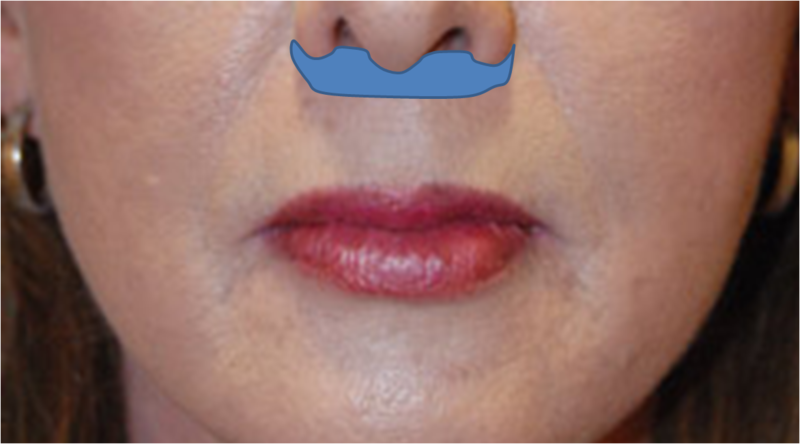 So you never want to make the upper lip the same size as the lower lip or this balance will be disrupted. Based on these fundamentals of how the lip should look you can do one or a combination of the above procedures to achieve these ideals. If the distance from the nose to the lip is greater than an iris width you can do a buffalo horn lip lift to shorten the distance. A picture below shows in blue where the excision of skin takes place to shorten this distance. The result of this will cause the upper lip to rise and also will tend to cause the upper lip to show more of the red portion which may or may not be beneficial. If the lips are thin, that is less than 1/2 iris width for the upper and one iris width for the bottom and less than one iris width in puckering in the upper lip and less than 3 iris widths for the highlight puckering in the lower lip you could volumize the lips with fat injections, temporary fillers, or permalip or other silicone permanent lip implant. You can also fill the lips with natural tissue implants from the temple or within the face (during a facelift for example) that can act just like the silicone lip implant. Filling can be done to cause more of the red lip to show. If there still requires more of the lip to show, you can do V-Y advancements to evert the lips more. This is done be advancing the mucose or the lining inside the lips in a way that causes the lip to evert more. You can read about these more here http://www.ayoungyou.com/?cat=15. Corner of the lip lifts do just that and raise the corners. The drawbacks with that are that you need an external incision to lift the corners. If you can accept an external scar this could be a good option. We have other blogs that discuss that too. Fat injections can fill the lips, evert the lips and volumize the whole mouth area to rejuvenate the whole mouth or perioral area.